As you may know, there are many causes of hair loss in women. Luckily, most of it can be reversed. Using both a topical and internal approach to stopping your hair loss will reap the best rewards. One of the best topical treatments is using jojoba oil and essential oils massaged into the scalp. 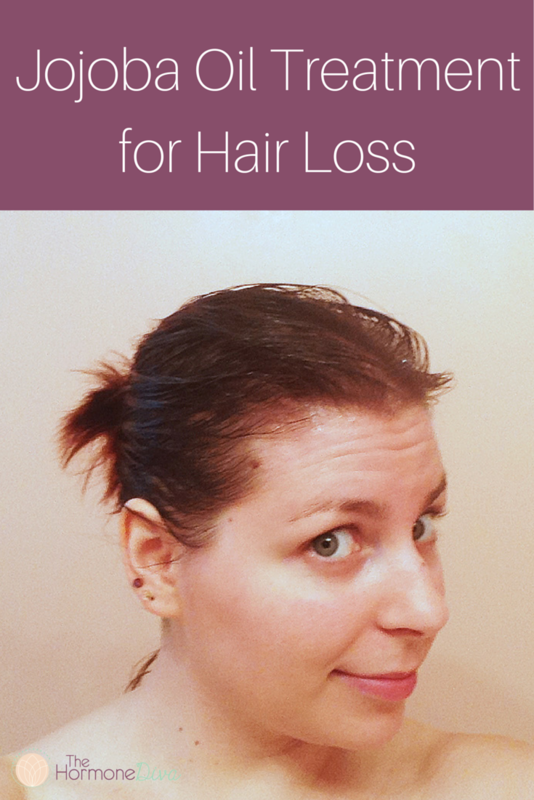 I have been using this as a natural treatment for hair loss for nearly the past year. As you can see, I’ve got the treatment on my scalp in the photograph. I not only saw a decrease in the amount of hair falling out, but also lots of new growth. Jojoba oil is extracted from the jojoba plant. The oil is fairly neutral, meaning that most people will not have a reaction of any kind to this oil. The use of this oil for hair loss actually comes from Ayurveda, the Indian healing practice that has been in use for thousands of years. Jojoba oil works to moisturize your scalp, stimulating hair growth. Jojoba also cleanses the scalp of excess sebum build-up, the oil produced on your scalp that is often too high when there are excess androgens, as in the case of PCOS. Lastly jojoba oil stimulates circulation on your scalp, bringing new blood flow to your hair follicles, stimulating growth. Essential oils are very concentrated extracts of plants that have medicinal value. Essential oils can be used topically or internally. They are often used for aromatherapy as well. There are many essential oils for hair loss. While you can use any number of essential oils for hair loss, including lavender, cedarwood, cypress and sage– the following treatment uses rosemary essential oil. Rosemary essential oil is one of the best oils for hair loss. Rosemary essential oil helps to increase circulation at the scalp which is great for rejuvenating hair follicles. Rosemary is also a natural anti-androgen, thereby helping reduce the DHT (‘bad’ testosterone) that builds up on the scalp in the case of PCOS and androgenic alopecia. For other causes of hair loss, you may want to blend some of the oils mentioned above with rosemary. Just be sure to keep the jojoba:essential oil ratio the same. Mix the jojoba and essential oil together. Dip the tips of your fingers into the oil mixture and gently massage the oil into your scalp. Be sure to massage into the areas where you have the most loss, like the temples, hairline and top of the head. Let the oil treatment sit on your scalp for 15 to 20 minutes. Wash your hair as normal after letting the treatment soak in. Be sure to thoroughly wash the oil out of your hair, or it will be oily when you dry. Give your scalp a nice massage while you shampoo, this will do the trick. Repeat this treatment two times per week for at least 6 weeks and up to 3 months to see best results. This recipe makes enough for approximately two treatments. Have you tried this treatment? Did it work for you? What are your favourite ways to naturally combat your hair loss? Do you think jojoba oil can be used as a leave in treatment or does it Have to be washed out? Although I have never tried it as a leave-in treatment, there’s no reason why not! Jojoba is a light oil, and unless you have very fine hair, using just a touch shouldn’t weight it down. This makes it really good for scalp/skin because it won’t clog pores or create a very greasy feeling. I have used castor oil on my eyebrows and hairline at night- and didn’t need to wash out. My suggestion: Put just a little bit right on your scalp and leave in overnight. In the morning, assess whether you need to wash or not! Let me know how it goes- I’d love the feedback! What you are trying to do is combat all the reasons balding occurs. Also I would recommend that one take Curcumin orally as it is an anti-inflammatory and will help if one has a reaction to any of the aforementioned components. National Institutes of Health” on Peppermint Oil. It contains photos of rats that were on Minoxidil vs rats on Peppermint oil. Peppermint Oil won. I have been using the jojoba oil by itself. I have used it three times and the last two times I have used it after leaving it in for a few hours I notice that a lot of my hair will fall out. Am I using it wrong? What could be causing this? I thought this oil is suppose to prevent hair loss? I am a little confused. You are absolutely right, this treatment is helpful for preventing hair loss. Not only that, it could help to stimulate hair growth. Note that I always recommend checking with your natural healthcare practitioner about these types of things to make sure the remedy is right for you. As for your questions: Firstly, I would say do not leave the treatment in for a few hours. My instructions for the recipe are 20-30 minutes max. Also, less is more- use the smallest amount of the oil mixture as possible on your scalp. Lastly, sometimes for the first 4 weeks or so it may seem like a lot of hair is falling out but in reality you are cleansing your scalp and stimulating new hair growth, so some old or damaged hair may have to go. Take it slow, and good luck! Hi, I had been having problem with my hair for a while, it stop and now is back after getting out of a bad/toxic relationship. I’m taking pantogar and rogaine for 6 months or more, I do once every 2 week a mask with coconut oil or olive oil. Last night I put some jojoba oil in my scalp for go sleep. I should say I put a lot, I tought it was good idea. Today I had been in shock a lot of my new hair star falling out. ( wich me think if I’m getting some where with the rogaine and pills since my hair should not fall for just using the jojoba oil…I read your comments above that you need to used just a few drops for 20/30 and then wash your hair…Do you think rosemary would make my hair fall, should I just stick with the coconut oil. I just need something for my itchy scalp bc is driving crazy, Thank you! Yes- please follow the directions as I’ve laid them out. Minimal oil and minimal time. Also remember that hair has growth and resting cycles. Rosemary oil helps to stimulate growth cycles and reduce DHT, the ‘bad’ form of testosterone that can cause hair loss. Rosemary is great for itchy scalp, as is lavender essential oil. Always purchase very good quality oils. If coconut oil has been working for you- keep going! Just add your essential oils to that medium. You could try that if you want, but I will tell you that I have not tried tea tree oil or coconut oil on myself or my client’s, so I can’t say it will work. Tea tree oil is extremely strong and should be very well diluted before using it anywhere on your body. As for a leave-in treatment, I wouldn’t recommend it. Look at the other comments for this treatment and see that I recommend only leaving it for 20-30 minutes before washing it out. Is there a difference between Golden Jojoba oil versus using other Jojoba oils? Is there a difference between Golden Jojoba oil versus using other brands? In my experience, the golden jojoba oil is less processed. If you find a jojoba oil that is 100% clear, most likely it has been refined. However, the main thing here is to find a reputable company that doesn’t use high-heat extraction methods, which damages the oil. The above information may not be true for all jojoba oils, but this is what I’ve seen in my experience. For the jojoba, I use the Golden Jojoba oil from saffireblue.ca. However, you can find any expeller-pressed jojoba oil. NOW is another great brand. I use pumpkin oil I leave in over night and wash in the morning should I continue doing that? Pumpkin seed oil is super nutrient dense and wonderfully healthy so I would say go for it! If something works for you, no need to reinvent the wheel. Taking some of that oil internally can be really beneficial for hair growth and many other things like urinary urgency and sleep. Can you suggest any brands/suppliers for pumpkin seed oil? i really want to try this! They have the purest and best manufacturing process for pumpkin seed products I’ve seen. Where can I find these oils? And will I still be able to add a few drops in to my shampoo and conditioner after doing this treatment? There’s no real harm in adding a few drops of rosemary essential oil to your shampoo as well. I’m not sure how effective the jojoba would be in that context. The essential oils are available at most health food stores, I purchase the NOW or Karoosh brands. Look for undiluted essential oils. For preventing hair loss and promoting regrowth of hair,I am going to use dermaroller followed by applying lavender oil,5 times a week. Also,I am going to use a combination of (Almond oil+castor oil+vitamin E oil+coconut oil+Emu Oil+Jojoba oil+Rosemary oil) 3 times a week. All I want to ask is that is this combination safe or can it have any side effects? In regards to your formula- it certainly sounds nutrient dense! All the oils you have mentioned coild possibly be beneficial for your hair. However, I can’t speak to safety for your personal body, as I don’t know your history. Ditto for side effects. Start with a test patch to make sure it’s okay before doing your whole head. All I am doing this is for hair growth near the fron hairline. I hope this works as I had seen learn this through the online videos of Eric. From what I understand coconut oil ranks 4 on a 5 point scale for clogging pores. Will clogged pores hinder hair growth? I definitely prefer to use jojoba oil. Some people do fine with coconut, others don’t. Like anything, it’s all individual. No information presented here should replace that of a medical doctor or other primary care practitioner. Nice method. The receipt is easy to do with only two ingredients. I just have a question, For better result, could we leave the mixed in hair overnight? Because I have known some oil may harm scalp if we leave it too long in our hair. No, I would not recommend leaving in over night. It will work as the recipe is, plus time. Hair growth takes a long time and leaving that mixture in longer won’t speed up the process. I have pcos and very thin hair on top. Would vitamin e oil or coconut oil instead of rosemary oil work as well or better??? Rosemary oil is almost medicinal in its effects, and as an essential oil, really isn’t the same thing as what would be considered a “carrier” oil- coconut oil. You could possibly replace the jojoba oil with coconut oil if you like, and/or add vitamin e oil to the mix. Whether one would work better than the other, I cannot say. You’d have to try it for yourself! Hi i would like to ask, If i can mix jojoba oil, rosemary essential oil and peppermint essential oil. If is okay, What is the proportion 1oz of jojoba oil to how many drop of essential oil? You can absolutely add peppermint essential oil to the mix. Keep the proportions the same as the original recipe, just use half rosemary, half peppermint in the jojoba oil. Just a quick question, would this still be useful if I simply used the Jojoba Oil without mixing it with an essential oil? Or do the two oils have to be mixed to have results? The essential oil is doing most of the job, the jojoba oil is acting more as a carrier of the essential oil, as well as providing a little benefit to your scalp itself. I highly recommend mixing the jojoba with the rosemary essential oil. I’ve seen this have good results. You can absolutely try just the jojoba but I don’t know what your results will be (if any). I lost lots of hairs. Jojoba Oil will help to regrowth the new hairs? Please advice which essential oil i can use with Jojoba oil? As I don’t know your history or the cause of your hair loss, I can’t say for sure if this method will help you. As you can see from the recipe on this page, I suggest using rosemary essential oil. If you want, follow the treatment recipe exactly and see how it works for you! First, because I don’t know your situation I can’t say for sure whether the methods you mentioned will or won’t work- only time will tell. Generally you need 90-120 days to really start seeing growth happening, as the hair goes through cycles. Second, I don’t see anything wrong with the methods you’re suggesting in a general sense. I choose not to wash my hair every day, as I don’t want to completely strip off the protective oils on the hair/scalp. There was definitely an adjustment period when I went from every day to every third day, where my hair was quite oily, but that died down after about 3-4 weeks. I like using a diluted apple cider vinegar rinse on my hair whenever I feel it’s getting bogged down and heavy with product build up, or just needs some freshening up. Generally I do this once per month, but some people use ACV instead of a conditioner on a regular basis. Try things and see what works for you! Hi I have pcos, my hairline right in the front is really bad, I have male pattern baldness, please help me regain the hairline with a remedy..?? Feel free to try the remedy in this post! Clinically I’ve found this treatment quite effective with myself and clients. Please give it 90-120 days to really start seeing new baby hairs growing in. You can also try internal remedies- I have a post on the site about choosing a supplement for hair loss, I suggest you read that. Of course, balancing your hormones and managing your PCOS to the best of your ability will work better for you hair than any topical treatment could. Good luck, and be kind to yourself! Please read the instructions carefully. It is noted that this treatment should not be left in the hair, but rather kept in for 10-15 minutes and then washed out. I’ve been using this treatment for three weeks and the last two times I’ve used it fifty or so hairs have come out is this normal? Some people (myself included) noticed more hair coming out when first using this method. It usually takes 4-6 weeks for things to even out. You can continue and see what happens or discontinue the treatment- only you know your body best! How long until you saw the effects of treatment? It was 2-3 months before I saw new baby hairs growing in. About 6 weeks before my hair stopped falling out so much. I’VE been using jojoba oil for a week.Should i use the oil daily on my hair or should i use it 2 to 3 times a week and if i use oil daily will it be a problem. I personally have never used the treatment daily, and I haven’t recommended any of my clients use it that way, so I’m not sure what would happen if you did. Likely twice a week is more than enough, and over washing hair that’s already really sensitive isn’t always the best idea anyways. Hi, I haven’t used my jojoba oil yet but my hair is thick but does the oil help my hair get softer too?? In my experience, yes- it definitely helps to soften the hair! hlo…am having PCOS problems and am having bunches and bunches of hairfall everyday.. so do these jajoba oil and rosemerry oilwill help to regrow my hairs quickly? will there be any side effects for this? The truth is nothing will regrow hair quickly. Hair has a life cycle is must go through, and you can’t really speed it up. However doing treatments like these and making important dietary changes will help hair to regrow. The only side effect I’ve noted (doesn’t mean it’s the only one) is that in the first few weeks of doing this treatment, many women experience a little extra hair coming out. It took me about 4-6 weeks for everything to even out, and for my hair to begin falling out less. Give it a try if you feel like it’s right for you. I have very thin temples and lose about 200 hair sometimes more due to Female Pattern Hair Loss and Chronic Telogen Effluvium. I am afraid to use Rogaine. Should I try your recipe? This recipe is mainly meant for women with androgenic alopecia (hair loss due to high androgen hormone levels), and that is specifically why rosemary essential oil is used. I am not familiar with Chronic Telogen Effluvium and can’t say whether this treatment would work. Other ingredients or essential oils might be needed instead of jojoba/rosemary. I would consult someone who has experience with your specific condition to find a good topical treatment. I’m so glad you found something that works for you! Amazing! This is for anyone facing hairfall problem. Just mix 1tsp each of olive and coconut oils. Warm it (not in the microwave please). I usually boil water and then place my cup on top of the got water. And then massage your scalp at night and wash your hair in the morning. SERIOUSLY, THIS IS THE BESSST SOLUTION. Ps please invest in a good quality shower filter, and for better results switch to organic shampoo’s which are free from sulphates :)! I went to sleep, overnight, for hours with jojoba on my hair. There was no hair loss and my hair felt more conditioned which is a good thing. Remember, oil attracts everything meaning it’s a “magnet”. The heavier your hair the more prone is to break. Hope this helps. Thanks! Was looking for something effective to counteract the 4-year-ago when hair loss with no recovery that i can see please continue sharing and updating. blessing! I have a question. Which one is a better carrier oil(rosemary or peppermint) to mix with jojoba oil for hair regrowth? I have PCOS. Carrier oils are the basic blending oils (IE jojoba, grapeseed, etc) whereas rosemary/peppermint are essential oils, and should only be used in small amount. I have a hair fall problem. I don’t have any of the essential oils, can the jojoba oil be used by itself? Would the recipe be the same if I added castor oil or coconut oil to it? The essential oils are the ingredients with medicinal action, so they are really necessary. The jojoba is just a really good carrier oil that works well on the scalp to help deliver those essential oils. While jojoba, castor oil and coconut oil also have some medicinal action, it’s not as strong as essential oils, although I’ve heard rave reviews about castor oil by itself, I’ve never tried it myself or with any of my clients. Hi, I have PCOS and also have extremely oily hair. Would this recipe suit people who have oily hair like me or would it only make it oiler and worsen my hair loss? It works really well for oily hair. Just make sure to wash out all the oil in the shower! Thanks! Can’t wait to try out this recipe. Hi can i mix jojoba oil + castor oil + rosemary oil + olive oil for better results ? You can absolutely mix oils! I can’t speak to whether this will be better as everyone is different, but it can definitely be done. Thanks for your very helpful article. If i use this treatment twice a week, is it ok to still add rosemary to my shampoo or conditioner? Which is better? Will it make a diff? I read that rosemary has side effect if overused. So, i m kind of worried if i overuse. What is the difference in the type of hair loss that will render peppermint oil instead of rosemary EO better? Another recipe calls for rosemary, peppermint & clary sage safe mixed with jojoba oil. How does clary sage help? I hv lot of coconut oil at home. Quite oily thgh. Is coconut oil or jojoba oil ok? I would recommend reading through all the comments on this post, as many of your questions have been answered already! As for how specific essential oils can help, hit up an EO expert, because that’s not me! Hi ,I have Androgenetic alopecia and right nowhave dermatitis on my scalp. Heavy itching and very sensitive scalp.Have afeeling as though an insect crawls. Heavy hairfall too. Do you think Rosemary with Jojoba will help me now? Thanks in advance. It may help Alice. You may also want to look into specific essential oils for the itching/sensitivity….tea tree and lavender come to my mind but do a google search. Rosemary helps with the androgens. I have got hair transplant done last year,but density is not so good, have very light hairline. Should i try above treatment for better results? As I don’t know the cause of your initial hair loss, I can’t say for sure. Let me know how it goes if you try it! I am loosing my hair like crazy. I have tried so many things even doctors, but it’s still same. I just found your blog and tried jojoba oil and rosemary oil 3 times, once a week. Still don’t see any development. Does it really work? Don’t get discouraged! Any treatments for hair loss typically require 3-4 months of consistent use to really get noticeable hair growth. I’ve read that it is good to heat the oils before applying them onto the skin. Should I heat them before or does it damage the oils? Should I keep the hair covered with a towel to keep it warmer? I hadn’t ever thought about heating it up. However, heat opens pores so perhaps it would be helpful in sinking the oils in deeper. Give it a try and let us know how it goes! I was wondering if i has a good mixture.? I am currently using rosemary, cedarwood,lavender, castor oil. How should I mix these oils ? Is castor better than jojoba and grapseed oil? What is the best hair loss essential oils with carrier oil mix for hairloss and receding hairline ? I’m truly not an essential oils expert, so I would recommend checking out Dr Mariza Snyder, she may have what you’re looking for! The oils I mention here are mainly for androgenic alopecia – or hair loss due to high levels of androgen hormones. Whether they will help with thyroid-related hair loss as well, I can’t say. Can I use jojoba oil with levender essential oil..?? Sure give it a try! I started using oil treatments in my hair about a year ago when my stylist used one on my hair. I love the Somaluxe Argan Oil! It makes my hair super shiny and brings out my highlights and lowlights big time. The smell seems to last the whole day through too! Secondly, it contains my frizz in a big way which is nice because I heat style my hair and dye it and it was already frizzy to begin with before I started doing all that stuff.